This high-quality PopUp gazebo is ideal for portable use. Due to its aluminium structure, it is particularly light and can be easily transported in the supplied carrying case. For high stability, the aluminium has been treated with anodizing and is therefore 15 times stronger than conventional aluminium. The vertical poles have a robust square profile with an edge length of approx. 32 mm and a wall thickness of approx. 1 mm. At the connecting points, the roof poles are connected by solid nylon material and are appropriately bolted. As such, all parts are interchangeable. The practical scissor mechanism for this PopUp gazebo allows a quick set-up and dismantling of the product and is fixed by a click system. The roof tarpaulin consists of approx. 300 g / m² heavy, PVC-coated high-performance polyester, which is 100% waterproof. 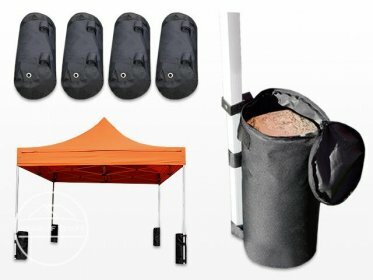 The PopUp gazebo is fivefold height-adjustable and is delivered with a sturdy transport bag. Our current offer includes two extra side panels for free. Portable weather protection at a small price. Protection from rain: work and party under a shelter. Can also be used as an entrance canopy or awning. Lightweight, sturdy aluminium structure for easy transportation. Thanks to a practical scissor mechanism with an integrated click system it is erected in no time. Construction with scissor mechanism for fast assembly and dismantling. Connectors and securing bolts are made of special, high-quality nylon material. This provides a high degree of strength and flexibility. It is therefore less sensitive and more stable than rigid plastic material. The linkage construction is bolted and can therefore easily be replaced in the event of damage – opposed to a riveted construction. Spare parts can be ordered via our spare parts form or by phone. The PopUp gazebo can be anchored by means of a hole in the foot plate - corresponding pegs are included. Reinforced contact points between frame and tarpaulin with friction protection. Construction is self-explanatory: Set up the main construction, raise it lightly, put on the PVC roof, completely unfold the PopUP gazebo, if necessary, attach the side panels.